In a battle of the compacts, which Volkswagen model can come out on top for you? When comparing the 2016 Volkswagen Jetta vs 2016 Volkswagen Golf, the main things you’ll weigh are overall costs, features and space, and the model that appeals most will likely come down to your needs. Styling is a factor that plays more on our emotions than our practical sides, but it is something to consider when comparing these two popular models in the VW lineup. The 2016 Volkswagen Jetta has the sleek lines you’ll only find in a compact sedan, while the 2016 Volkswagen Golf has a more robust appearance with its hatchback design. Some may say the look of the Jetta is more refined, but for that sense of elegance you’d be losing out on a whole lot of cargo space. There’s no denying one major benefit of driving a hatchback is the fact that the rear completely opens up to allow bulky sports gear and large purchases to fit easily. If you tend to travel light, this might not be a big factor, but you’ll notice the difference when you debate how to bring that new flat screen TV home. 15.5 cu. ft. Cargo Volume 22.8 cu. ft.
94.1 cu. ft. Passenger Volume 93.5 cu. ft.
You’ll notice the 2016 Volkswagen Golf costs more than a little above the starting price of the Jetta, and that could be a figure that will make the decision for you if you’re on a tight budget. One thing to keep in mind, though, is the fact that the Golf also comes in two-door options that are available for order. This means you won’t find them in showrooms, but if you test drive the Golf and find you prefer it, you can find more affordable options. A base TSI version of the Golf, which has fewer features, is available with a starting MSRP of $18,495, bringing it much closer to the price of the Jetta. There are a number of reasons you might opt for either option, and the issue of price does complicate things. When comparing base options available at dealerships (that is to say, not order-only), the Golf has many more features than the Jetta and its 1.8-liter turbo four is more potent than the 1.8-liter turbo four. Some things that won’t change? Every trim level of the Golf is more spacious than the Jetta. Passenger volume in the Golf is 94.1 cubic feet compared to 93.5 cubic feet in the Jetta. This might not sound like much, but it doesn’t go unnoticed for rear seat passengers. More importantly, the Jetta has 15.5 cubic feet of cargo space compared to 22.8 cubic feet in the Golf. Because it’s a hatchback, you can fold the seats flat in the Golf and open up the rear seat space to 52.7 cubic feet. In the Jetta, you just won’t find that space. One benefit of the Jetta is that it does get better fuel economy than the Golf. Again, the numbers aren’t staggeringly different, but for those who put on a lot of miles each week, you’ll appreciate the savings. Again, however, this is because the base Jetta has a smaller engine, which means you can expect a 150-horsepower engine compared to a 170-horsepower one. The closest comparable options are likely the Jetta Sport, which features the same 1.8T, to the base Golf S. When considering these options, you’ll find the Jetta has the same fuel economy, transmission options and engine as the Golf, with similar or better features. Ultimately, the differences between the Jetta and Golf come down to price, practical benefits and features. 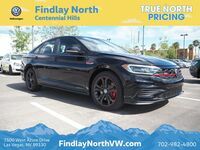 If you don’t need much in the way of cargo space and want a vehicle with all the latest technology, the price of the Jetta provides wiggle room to upgrade to higher trims while offering the same powerful engine as the Golf, but the Golf won’t be outdone when it comes to roominess. Stop by Findlay North Volkswagen to check out both options and see which compact is right for you.